There is a Good News Here for those who are looking out to earn money online! This method allows you to earn real cash in your PayPal Account by simply keeping one App Installed on your Smartphone. Yes you heard it correct, there is an exclusive Facebook Research project being conducted by Applause Inc. which pays you every month via PayPal by simply keeping their App Installed on your Smartphone. Additionally participants also have more opportunity to earn more and more as they want each month with no actual work requirement. So today in this post we will explain to you each and every details on how to earn money with Facebook Research Program by Applause. How Much Money Can I Make with Facebook Research Program by Applause? If you keep the Facebook Research App Installed on your smartphone then you can earn $5 per month, but to can maximize you’re earning by referring your friends. On referring at least 5 friends, however they should be having app installed and kept running on their phone. And then only you would be able to fetch $75 per month additionally. There is no limit to how many referrals you can provide! Refer 5, 10, 100 or more friends and see your monthly payout increase with every referral that joins! How actually you make money with Facebook Research Program by Applause? Facebook Research Program is been conducted by Applause, on joining and installing the app you are giving Facebook the permission to collect the data from your phone that will help them to understand how you browse the internet and how you use the features in the apps you’ve installed on your phone. All this collected data will be used by Facebook and won’t be shared with unaffiliated third parties. This means by installing their app you’re letting them to collect information such as which apps are on your phone, how and when you use them, data about your activities and content within those apps, as well as how other people interact with you or your content within those apps. You will also let Facebook collect the information about your Internet browsing Activity (including the websites you visit and data that is exchanged between your device and those websites) and your use of other online services. There are some instances when they will collect this information even when the app uses encryption, or from within secure browser sessions. Tap “Agree” to participate in the research and begin installing the software on your phone. By doing so, you’re also agreeing to keep this research, and your participation in it, strictly confidential, and not disclose any information about this project to third parties. This research helps Facebook understand how people use mobile apps so that they can improve their services and introduce new features for millions of people around the World. 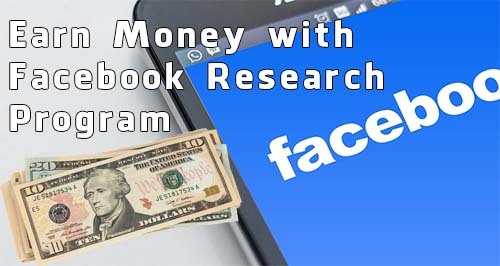 In order to do this, they are running this Program called Facebook Research Program which is managed by Applause and on joining the participants gets paid for it. Important Update: Effective 8/15/2018, Utest will not be accepting any new participants within the segment(s): Adult Males, ages 18-35, located in India with Android mobile phones. While they will still accept individuals within this segment as referrals, but they will not be able to sign-up for the project until the segment is re-opened. So if you want to join this program and get paid then while registering, register as female and add age between 13 to 17 Years. While you will still be able to submit individuals within this segment as referrals, they will not be able to sign-up for the project until the segment is re-opened. Thank you for your ongoing participation in our research program. Our records show that you are currently an active participant; as such, we are emailing you today to inform you of an important change to the program. Effective September 1, 2018, the monthly payment rate for participant activity and for individual referral activity will be $1.50. This rate applies to the amount you receive each month for your own participation in the program, as well as the amount you receive each month for each of your participating referrals. This change will first be reflected in the payment you receive for September activity, to be paid on October 15th. Thank you for your ongoing participation in our Research Program. Our records show that you are a recently active participant; as such, we are emailing you today to inform you of an important change to the program. These rates apply to the amount you receive each month for your own participation in the program, as well as the amount you receive each month for your participating referrals. These changes will first be reflected in the payment you receive for September activity, to be paid on October 15th. How to Join Facebook Research Program by Applause? To Join Facebook Research Program by Applause you will need to just submit the form by clicking here. You will receive Invitation Email by Applause Research Program within 24 hours through email which will contain signup and download link of the App. You just need to refer to the email, and register for the project by clicking on registration link mentioned in the email. 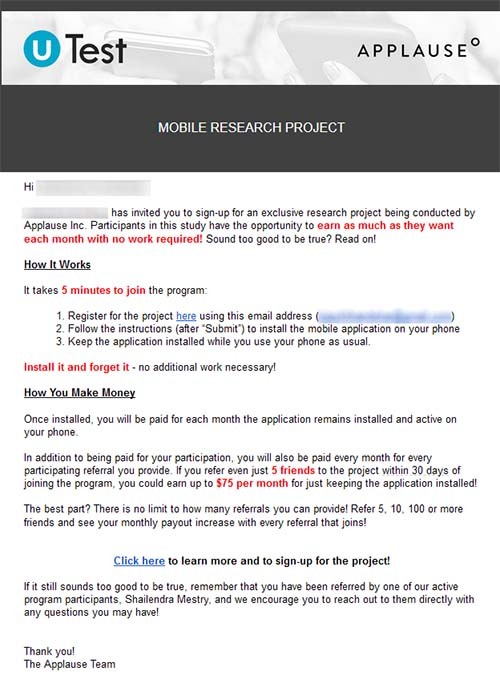 Below is the sample of the Applause Research Program Invitation Email. On signup page you will have to fill in your details like your email id, select gender, enter your date of birth and click on submit button. On next page it will display message saying congratulations you are in, which means you have successfully registered for the program. And it will also include download link of the app and install code, the same details will also be emailed to you. You just need to download the app by tapping on that download link. A new page will be opened of Facebook research App, from that page you just need to tap on Install Application Button and your browser will prompt you to save the APK File. Just tap on OK button to start downloading the App. Once the app gets successfully downloaded on your smartphone, to start installing just tap on the downloaded app. If while opening the app you get a message displayed saying “for security, your phone is set to block installation of apps obtained from unknown sources” then just go to mobile settings > security > and allow installation of apps from unknown sources. Once you allow it, just open the downloaded APK again by tapping on it. Just tap on Install button and the app will start installing on your smartphone. Once the App gets installed just tap on open. You will be prompted to enter your invitation code, the invitation code will be mentioned in the email which you have received. Just copy the installation code and pasted into the app prompt and click on ok button. I understand that i am participating in a Facebook research panel about my app and browser usage. I understand that Facebook will be collecting data about my internet browsing activity and app usage, and may decrypt data from within encrypted apps or secure browser sessions (like HTTPS websites). I understand that this research, and my participation in it, is confidential. You will have to accept it all and tap on OK button to proceed. Next it will prompt you to install the certificate, so to install just tap on OK button. Next it will request you to approve VPN connection saying “Facebook Research wants to setup a VPN connection that allows it to monitor network traffic. Only accept if you trust the source”, so just tap on OK to proceed further. Next you will be requested to turn on accessibility permission, just tap on ok button and accessibility settings will open. Just turn on accessibility permission for Facebook Research App. Next it would request that you need to allow app usage access, just tap on OK button and apps with usage access settings will open. Just turn ON apps with usage access by tapping on permit usage access for Facebook Research App. That’s it the Facebook Research App will display message saying “Successfully Installed”, Thanks for participating in the research. Now you need to just keep this app running in background and it will make you earn $5 per month without doing anything. You will receive email regarding Installation Confirmed of Facebook Research Program App in next 24 hours. You will be able to VPN is activated by Facebook Research on your smartphone status bar. Additionally you can enhance your earnings referring you friends. You can refer to below tutorial on How to Maximize Your Payout. How to maximize your Facebook Research Program Earnings by referring your friends? Once you have successfully installed app on your smartphone, within 24 hours you will receive email confirming your installation. It will also contain a tip with which you can maximize your payout by referring your friends. There will be special link mentioned in the email by opening you would be able to invite your friends by entering their email and name. Once you invite them, they will receive email from Facebook research within 24 hours. And once your friends successfully signup and installs the app you would be rewarded monthly. If you refer just 5 friends to the project within 30 days of your official start date, you could increase your earnings to $75 per month for just keeping the application installed! 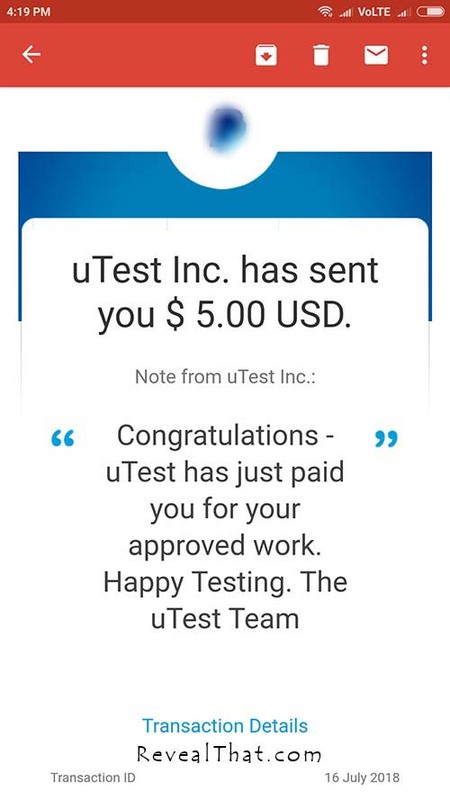 Payment Proof of Facebook Research Program Sent by uTest Inc. I received my first payment on 16th July 2018, i had joined this program on 5th June 2018. 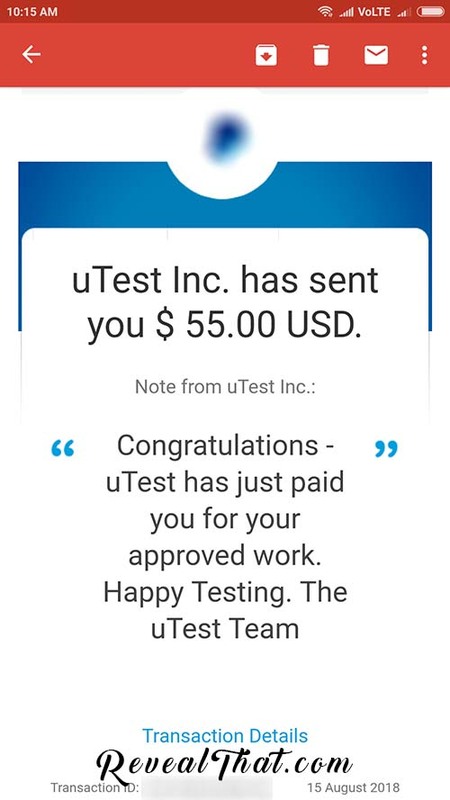 And after almost 1 Month keeping running this App i earned $5 and same was received in my PayPal Account, you can check out below screenshot for your reference. thanks for sharing this info…very helpful..